NBA Game Time for iPad 2013-2014 was updated yesterday, to Version 5.3. 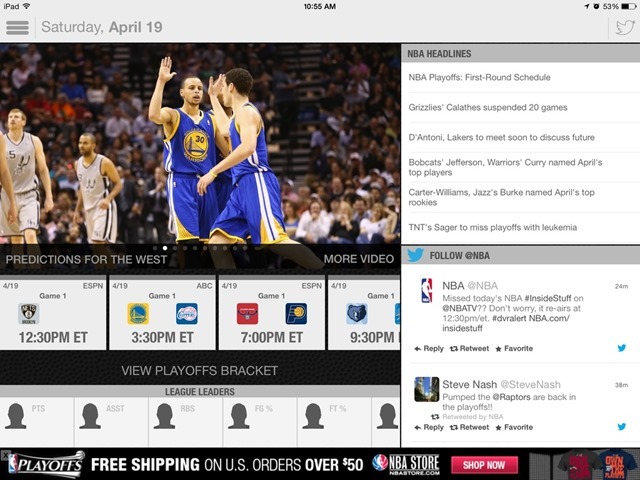 It’s that time of year again, NBA Game Time has been updated for the 2014 NBA Playoffs. We’ve added a live playoff bracket showing status for each series and the most recent games. Good stuff, especially for those times where a game you really want to see is not on TV or you just can’t be around a TV. As always, I’m looking forward to the playoffs – and this is a great app to help me keep up with them. Here’s an App Store link for NBA Game Time 2013-2014; it’s a free app.